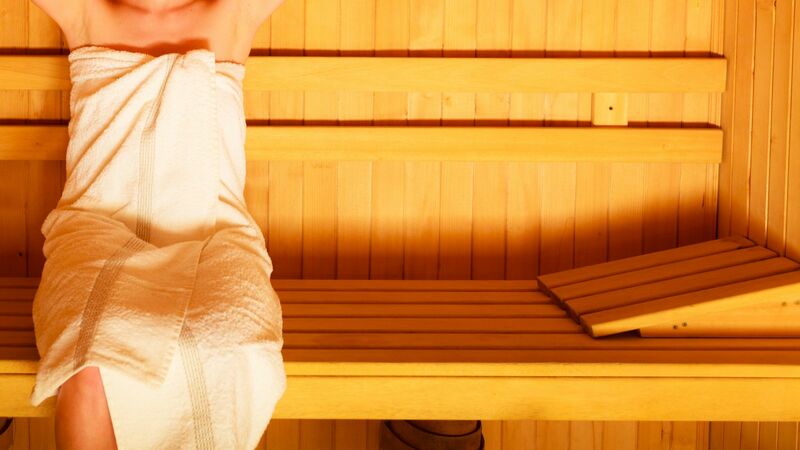 A saunas' dry heat (which can get as high as 185° F) has profound effects on the body. Skin temperature soars to about 104° F within minutes. The average person will pour out a pint of sweat during a short stint in a sauna. The pulse rate jumps by 30% or more, allowing the heart to nearly double the amount of blood it pumps each minute. Most of the extra blood flow is directed to the skin; in fact, the circulation actually shunts blood away from the internal organs. Blood pressure is unpredictable, rising in some people but falling in others. "All in all, saunas appear safe for the body, but there is little evidence that they have health benefits above and beyond relaxation and a feeling of well-being," says Dr. Harvey Simon, editor-in-chief of Harvard Men's Health Watch. However, heart patients should check with their doctors before taking a sauna. Studies show them to be safe for people with stable coronary artery disease. "But patients with poorly controlled blood pressure, abnormal heart rhythms, unstable angina, and advanced heart failure or heart valve disease will probably be advised to stay cool," says Dr. Simon.